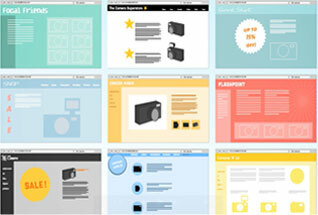 Talking to your visitors, a new way to sell on the web. Keep using your usual IMs! Chat using your phone or tablet! Organize your agents into groups, route chats to the most appropriate agents. Initiate conversation automatically with your customers before they leave! Our tools will give your customers a great experience! 1. Talking to your visitors, a new way to sell on the web. 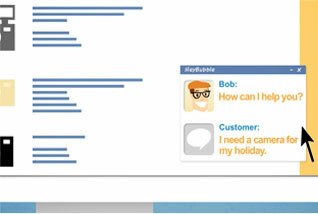 With HeyBubble live chat you are now able to create trust between you and your visitors. 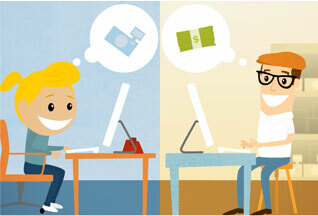 You can interact with them and turn them into loyal customers. They feel helped step by step, whatever you are selling. Your website representatives can engage the conversation when seeing a visitor in trouble (for example a payment, or after a certain time), our really easy and intuitive Dashboard will tell you what pages they are surfing on, what language they speak and much more. 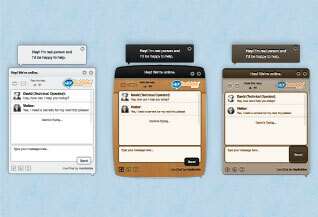 The chat window is very flexible thanks to our customization tools. 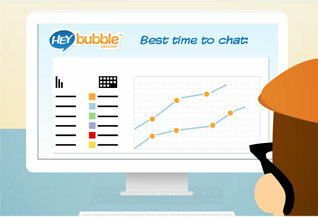 Try HeyBubble for free, and you will see the impact of the live chat on your sales right away! As you can see on our own website, the chat window on the right bottom corner is beautiful (and several themes and looks are available!) But the inside is great as well. Our Dashboard is incredibly simple to use, a complete tool that gives you the ability to control flow on your website and interact with people efficiently. With our analytics, statistics and reports, you can manage the general activity on your website, and at the same time, monitor each visitor to solve their problems, answer their needs, or simply collect feedback. Try HeyBubble for free to have a full access to the Dashboard! 3. Keep using your usual Instant Messaging Systems. Chat using your phone or tablet! You can monitor your visitors from wherever you are, HeyBubble live chat works with all your usual Instant Messaging systems such as Skype, (and any chat client that supports Jabber (XMPP), full list here). 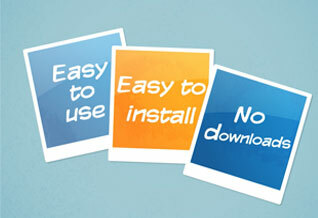 Most of those Instant Messaging clients are available on desktop mobile and tablet. For more details, visit our Help & tutorials page. The chat window will be part of your website with our customization tools, choose the color and shape to match your design. Add your logo, social network links, ratings of your agents by visitors, and more. Provide your website visitors with an attractive, instinctive, non-intrusive and easy to use interface that will smooth the way your visitors shop online. 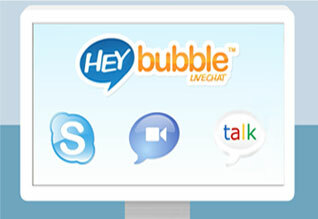 Try HeyBubble for free and customize your chat window to surprise your visitors. 6. Very helpful reporting and statistics. Improve the behavior of your agents by checking the rates given by your visitors and the ability to saved conversation transcripts. 7. Organize your agents into groups, route chats to the most appropriate agents. You can create groups and categorize your agents into groups and automatically route chats to respond precisely to each particular request with the most appropriate agent. If the member to respond is not an appropriate fit, you can transfer the conversation to another operator in a snap! Try HeyBubble for free and build your online teams! 8. Initiate conversation automatically with your customers before they leave! You can set up messages to be sent automatically to your customers after a certain amount of time spent on your website, or on a particular page. You can now grab your visitors' attention just in time before they leave your website. 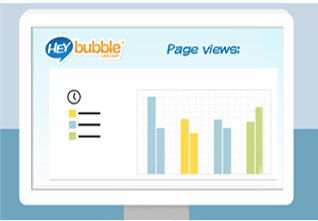 No matter how many websites you want to integrate HeyBubble on, you can use our embedded chat widget on as many websites as you want..
You will see the pages your visitors are surfing on and the statistics will be linked to all your websites. 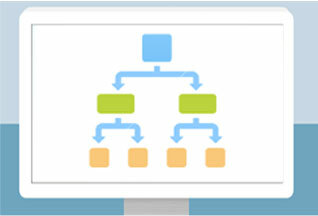 Try HeyBubble for free and provide the best support to multiple website from the same dashboard. 10. Our tools will give your customers a great experience! All our tools will surprise your customers: a beautiful chat window that matches with your website's design, a web interface that allows you to feel what your clients need before they leave, a chat compatible with mobile devices and desktop, a great team at your service, and... it's free. Improve your benefits and beat your competitors thanks to our awesome live chat and real-time support tools.